It’s getting colder already, and long range forecasts predict snow as early as October, so now is the time to fit winter tyres – but are they worth the cost? Winter tyres, or cold weather tyres to give them their accurate title, are becoming increasingly popular. Until the exceptionally cold winters of 2009 and 2010 the sales of winter tyres were negligibly small, but come the enduring snow of the past two years interest soared. However, sales are still relatively small in the grand scheme of things. Many people don’t understand the benefits of winter tyres, and some can’t justify the costs involved in changing every six months. 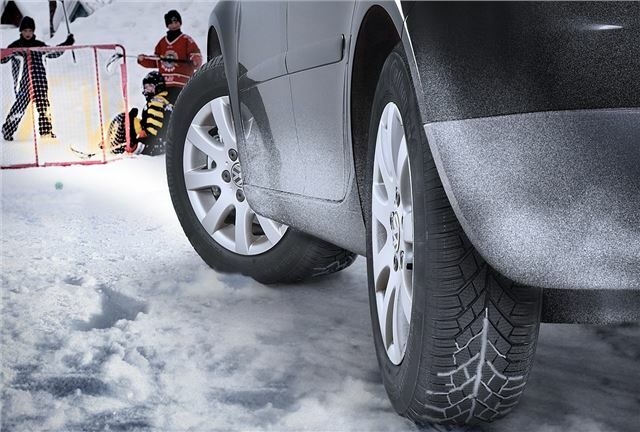 Winter tyres are not solely designed to improve traction over snow and ice. While they do indeed perform better in such conditions, they’re also better in all weather conditions, including dry weather, at 7°C or below. This is owed to the different compound used in winter tyre construction, which contains more natural rubber. The increased amount of natural rubber means winter tyres are softer and more flexible in cold conditions, which improves traction. Think of how much your car sticks to the road on a warm dry day compared to a cool damp one, and you’ll understand the importance of a softer compound. When it does get particularly cold and it begins to snow, winter tyres provide improved traction too, thanks to tiny gaps in the tread called ‘sipes.’ Sipes purposefully trap snow, which might sound a little strange, but if you remember your days of building snowmen you’ll remember that snow sticks better to other snow than it does anything else. The sipes mean there is sufficient snow to grip onto other snow, yet enough rubber to grip the road surface. The result is astounding in practice. We had the opportunity to test winter tyres against summer counterparts, care of the SMMT, on simulated slush and simulated ice. On a downhill ‘ice’ covered slope a car with winter tyres behaves as a car with summer tyres would on a wet road. It’s possible to steer and stop relatively safely and avoid obstacles. Meanwhile, on summer tyres there is shockingly little traction. On the same surface, the car with summer tyres was completely unresponsive. Steering inputs had little or no effect on the direction of travel and braking had, it seemed, no effect on the car whatsoever - it glided on in whatever direction it chose until it stopped naturally. Equally, if anything caused the car to skid it was easy to correct and regain control, even on simulated ice, with the winter tyres. It took far longer to recover the car with summer tyres, and the car was more prone to spinning. In the below video the silver car is fitted with summer tyres is thrown into a huge skid by a kick plate, a device used to induce skids. The darker coloured car is the same as the silver one with the exception of it being fitted with winter tyres. It's kept under control with absolute ease when the kick plate is triggered. The surface was simulated ice, made of polished plastic covered with water. Should the test have been carried out on a public road in winter, an accident would have been absolutely unavoidable with summer tyres. But with winter tyres making safe, steady progress was as simple as it would be on a rainy day. In measureable figures the differences are obvious, too. On a snowy road at 30mph a car fitted with winter tyres will stop 8m or 26 feet shorter than the same car on summer tyres, a distance that equates to around the length of a bus. In icy conditions the differences are more apparent. A car on summer tyres will travel 11m further when braking from 20mph on ice than a car on winter tyres. It’s fairly easy to recommend winter tyres if you’ve experienced them first hand in the conditions they are designed for, but they do cost money. Many will argue that tyre companies just want more of our hard-earned cash. But a set of winter tyres needn’t cost much if you keep hold of your summer tyres too. That way you’ll only wear your winter tyres for winter months and summer tyres for summer months, effectively doubling the amount of time each set lasts. So really it doesn’t cost much extra in the long run. If you’ve nowhere to store your tyres when not in use then some companies will take care of them on your behalf, and even check they’re safe before you refit them. So the cost of fitting and the cost of storage are, after initially buying a set of winter tyres, the only expenses to worry about for at least a few years. Furthermore, you’re much less likely to have an expensive or dangerous accident thanks to the improved traction and reduced stopping distances. If you do buy winter tyres, though, most will have a different speed rating, so you’ll need to let your insurer know you’ve fitted them and your insurance costs shouldn’t rise. Realistically your premium should be cut given the improved safety, but that’s unlikely. For a selection of tyre related questions and answers, click here. smaller containers are used by factories to store latex rubber.